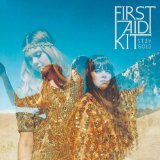 “And the only man you ever loved, you thought was going to marry you, died in a car accident when he was only 22, and then you just decided love wasn’t for you” The touching lyric from First Aid Kit’s 2012 single “Blue” shows the poignancy of the young Söderberg sisters. Old souls, wise beyond their years and every other similar cliché can be thrown their way. Still just 24 and 21 years old, Johanna and Klara are already veterans of the music industry – having had #1 records in their native Sweden, performed with Fleet Foxes, rubbed shoulders with Connor Oberst and Jack White – Stay Gold is their third album in four years. While the tracks take on a more personal feel than past efforts, they contain a universality that are easily relatable. “Now I can’t believe that it’s been five years, since we both stood here looking out at this city, with minds so bold and thoughts so clear”. On their first release for Columbia Records, Johanna and Klara absolutely stay gold throughout.